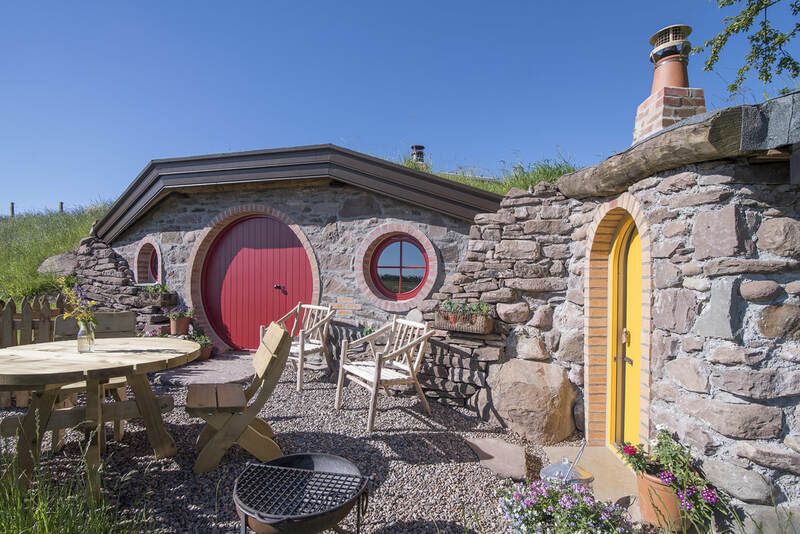 Built right in to the hillside and adorned with grassy roofs and round doors, a stay in a Hobbit Howf will transport you to a magical world of Lord of the Rings, amongst friendly 'heelin coo's' and 'wee goats'* in a shire all of your own. "In a hole in the ground there lived a hobbit. Not a nasty, dirty, wet hole, filled with the end of worms and an oozy smell, nor yet a dry, bare, sandy hole with nothing in it to sit down on or to eat: it was a hobbit-hole, and that means comfort" - J.R.R. Tolkien, The Hobbit. Click an available start date highlighted to check availability and book. Check in - Please arrive from 3pm and depart by 10.am. If you do have an idea of your arrival time do let us know - as it helps us greatly. Please use the comments box on the booking form to let us know. If you have stayed with us before we always like to know that to! Traditionally built from stone and wood, with nooks and crannies. Toilet- designer eco friendly compost toilet in its own wee hobbit howf next door, with hand carved wooden wash hand basin. What to bring - Torch, camera, food and drinks remembering that bottle of bubbly and of course time....... to just sit and enjoy this really unique Hobbit Howf set in your own slice of the shire! In the evening sit outside overlooking the views of the Ochils and watch the beautiful horses roam. Test your cookery skills on the BBQ and enjoy your food al fresco. You will be treated to lots of birds - we regularly have Red Kites fly overhead -, wildlife, soay and ryeland sheep, ponies, our two donkeys, our pygmy goats, a variety of poultry including turkeys, rhea, guinea fowl, ducks, geese and the stars of the show our two highland cows Uigg and Beag! There is plenty to do in the area in the day but if you don't feel like leaving the 'Hobbit Howf' you can just enjoy the two acres of grounds and gardens at Craighead. Kids - sorry but the Hobbit Howf is not suitable for children. Please contact for more information and for rates for longer stays. Please check our calendar above to see if your desired dates are available. If it is not available you can check if our Tree Howf, Wee Howf or Summer Howf are available - they are just as secluded!